We had a lovely time meeting lots of you at our open days for German, Spanish and Portuguese, Slavonic Languages, and Italian in February and March. However, for those of you who were not able to join us at these events, or those of you who are interested in languages not represented at those events, we have another open day on the horizon and we would love to meet any and all prospective students. This is particularly true for Year 12 students, but you are equally welcome if you are in Year 11 and are starting to explore your options. This open day will cover ALL of our languages: French, German, Spanish, Italian, Russian, Portuguese, Modern Greek, Czech, and Polish. Most of the joint school degrees will also be represented. * It will offer an overview of the degree, Q&A sessions for indidivdual languages, and a chance to chat to current students and tutors. 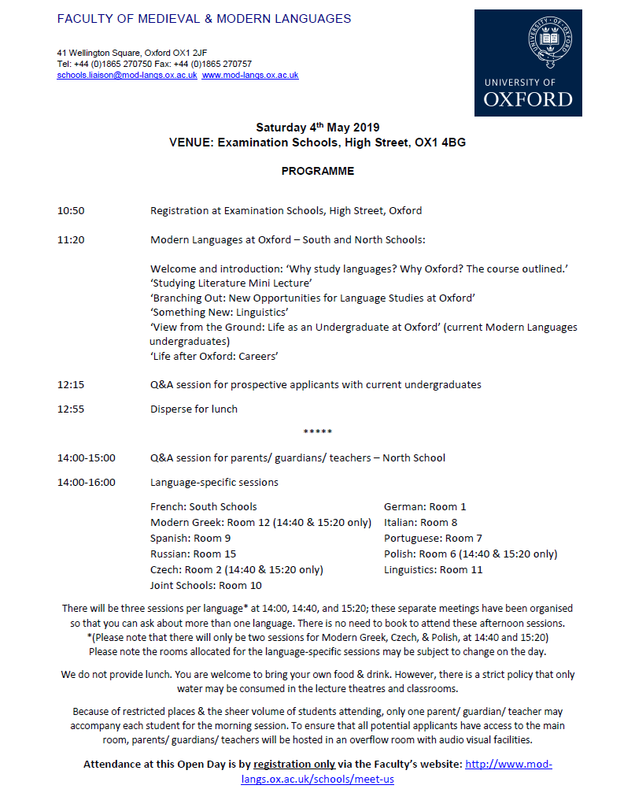 The open day will take place at the Examination Schools on the High Street on Saturday 4 May. A full programme is below. Booking is compulsory – at this link. We hope to see many of you there! *Joint degrees with Linguistics, English, History, and Philosophy will be in attendance, with Classics TBC. Students interested in the degree in European and Middle Eastern Languages should note that the Faculty of Oriental Studies will also hold an open day on the same date. You are therefore advised to visit both the Medieval and Modern Languages open day and the Oriental Studies open day in the same trip. A programme and booking details for the Oriental Studies open day can be found here.